General characters:The intimate symbiotic association of fungi and algae is called lichens.Algae get protection and get moisture from fungus.Fungi get nutrition from the algae.The food substances diffuse from algae to fungi.The algae of lichens mostly belong to Chlorophyta and cyanobacteria. Distribution: Lichens have worldwide distribution. The form major part of vegetation in Polar Regions. They can withstand extreme temperatures. Ascolichens: In this case, lichens belong to ascomycota. Majority of the lichens belongs to this group. It is further divided nto two groups on the basis of fruiting bodies. These groups are: Gymnocarpeae and pyrenocarpea. Basidiolichens: In this case, lichens belong to basiodmyrota. 4. Vegetative body: Lichens have thallus body. The thdli have diffi rent shapes and colours. But most of them are bluish green or grayish green. Some thalli bear apothecia. The lichens are divided into three groups on the basis of thallus. 5. 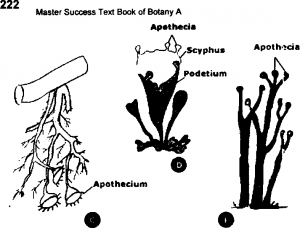 Vegetative and asexual reproduction: Vegetative reproduction occcrs by soredia formation. Asexual reproduction takes place by pyci idiospores, conidia oidia formation. 6. Sexual reproduction: Sexual reproduction is oogamous. Ascogonium and spermatia are formed. Fusion of nuclei produces asct:s or basidium. Ascus produces ascospores and basidium proc uces basidiospores. Characteristics fruiting bodies like apothecia, endothecia are also formed.